Pale pink, formal double flowers with stripes and flecks of a deeper pink. Vigorous growth with a compact, bushy habit. Flowers in mid to late season (March and April). Great product - really pleased! 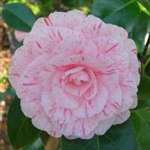 These Camellia's are not the first purchases made from this nursery. We are always delighted with the pruduct standard.